IMPORTANT! This deal lasts only for only two days beyond when this article was posted. Act now if you’re interested! Among the things that any designer needs, the freshest, hottest typefaces might just be right there at the top. Yeah, that’s right, boring ole’ fonts. See, the thing about them is that bad fonts are dreadful, but great fonts are exciting! In fact, great fonts can totally transform the quality of the work you’re creating. I guarantee that if you improve your font game, you will see a radical shift in how “professional” your work will start to look. Want to know why that’s important? More “professional” looking work gets better clients who pay you more money, you get paid more money and next thing you know, you’re buying yourself that new virtual reality headset thing which you use to log into the soon-to-be-released Tinder VR (probably) where you meet your future wife who gives birth to twins shortly after you both get married and one of those twins, probably the girl, grows up to invent the latest biomedical innovation that not only saves thousands of lives, but also goes on to win the Nobel Prize in Medicine. All because you improved your fonts. It’s kind of that important. This font jumped out at me because it’s a font that actually has found a way to make the dreaded stencil style actually look really good. This is such an elegant, beautiful font and it looks great when used for a heading or the body text in any project. Check out the bundle right here! One word to describe this typeface: CLEAN. You get 24 different variations of the Pseudonym font. This font is amazing because it looks so beautiful either as lowercase or uppercase. You just have to have this font. So versatile! Download the fonts here! As you’ll see from the list of my favorites here, I’m not the biggest fan of script fonts. They can be exciting, but limited. I prefer stuff that is more versatile and utilitarian, but this script is a sweet sauce of everything you want in a well-balanced and smooth font. Another must-have typeface in your collection. Love this font? Grab it here! This typeface seems to walk the fascinating line of appearing vintage and ultra modern all at once. You get 32 versions of this font with 8 weights + italics. It just looks so nice. Put over a solid color, create a monochromatic layout and slap this font in place, or do your best hipster impression and fade a photo and drop this type in place and it just freaking works. So, so nice. Buy the font bundle right here! Sometimes you see a font that looks so stylized and cool in all the right ways that it makes you want to sing. That’s this font. Not only is this font going to give you the perfect vintage/hipster style for that project you’re working on, but it has some amazing extras baked right into the font that will add a graphic stylization to your projects that will leave your friends and competitors red-faced and jealous. This font is a must-have! Pick up the bundle of fonts for yourself here! This is a simple font that comes in 6 different weights ranging from thin to black. The simplicity of this typeface makes it a very nice choice logos, titles, headings and much more. It also has a very complex italic version that feels like it would taste amazing (if it was a food.) It’s really quite remarkable. This font is so versatile and fit for so many uses. This is a typeface which would almost always be a great choice when you’re at that “what-font-would-look-best-for-this-logo” stage of any project. Grab the fonts here! When a font isn’t just called a font, but it’s called a “Font Collection”, you know you’re in for good times and that’s just what we’ve got in the Aviator Collection. I’m not even sure how this font fell to seventh on my list of ten here. This is a seriously amazing and impressive font collection. You should get this font bundle for this Aviator Font Collection alone. (for real) Get this amazing font collection here! I’ll just copy what they say about this typeface because it pretty well hits the nail on the head: “Malva was designed to perform as a branding element, providing a clean look for visual identities and publications. It brings a touch of friendliness to the communication without compromising the professional look every brand strives for.”–maybe a touch too pedantic for me, but hey, variety is the spice of life, as they say. Seriously, this is a pretty cool, clean font. Download the font bundle now! This is a fancy font. It’s got the swirl and swoosh game on-point. This font has an old world vibe and it also has a 1950’s vibe, it all depends on how you use it, how you style it, what colors you use, and how you choose to use the sweet array of special ligatures, swashes, and alternate letters to create your masterpiece. This is just a cool font. Buy the font bundle here! I have to be honest here, this font isn’t going to blow you away at first glance, but the value of this font lies in its simplicity and utter readability. 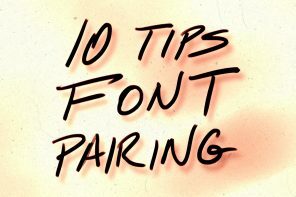 It can be used in such a wide array of applications that it will become a mainstay in your font book. It’s the type of font I could see using for a ultra-modern tech company or a line of baby clothing. Pretty cool. Do it! Give yourself additional tools to create the most beautiful work. Grab this font bundle for just $29 right here. Previous article38 Amazing & Beautiful Pieces of Star Wars Artwork and Inspiration!